You must make reservations at least 5 minutes in advance of the time at Up In Smoke. 3 minutes walk from Footscray Station.Bus stops just outside. Catering and function packages available for groups of all shapes, sizes and budgets. Email us at enquiries@upinsmoke.net.au with your enquiry! Bookings only available for groups of 5 or more, otherwise just walk in! Up In Smoke is a refurbished car garage turned sleek BBQ restaurant and beer garden located 5 minutes from the city. 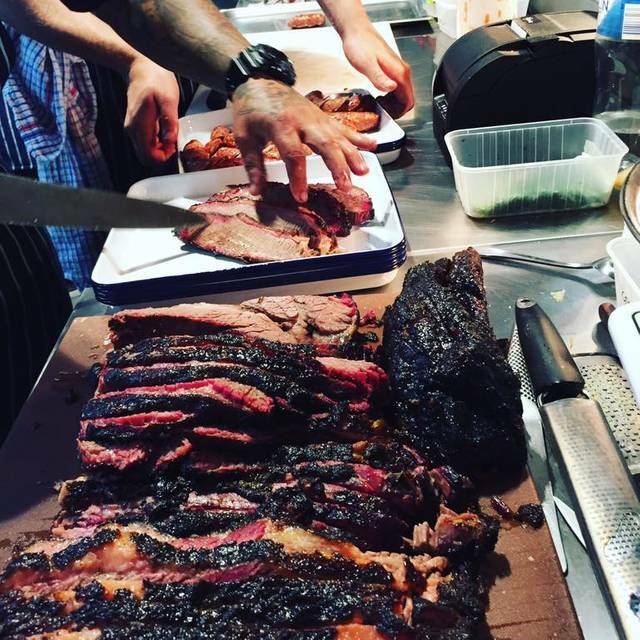 The star feature being a $20,000 smoker – the big, double-barrelled beast also known as a Yoder Frontiersman burns overnight slowly smoking all manner of delicacies including brisket, pork, ribs, sausages and wings making it some of the best smoked meat in Melbourne. A range of munchies from mozzarella sticks to jerk wagyu skewers all feature that irresistibly smoky flavour. Make sure to leave room for pumpkin pie or a house made donut ice cream sandwich for dessert. There are 10 independent craft beer taps on constant rotation, dedicated to showcasing the latest and greatest in local craft brews. While an extensive selection of bottled beer and spirits ensures that whatever your style, the drinks team will pour, mix, shake, stir or cork the perfect drink for you. Probably had higher expectations and was disappointed. Just lackd a bit of finesse. Sticky table tops, lacklustre service, food was a bit blah! It didn’t live up to the reputation. Good was pretty good, but the music was unnecessarily loud, the staff got a couple of orders wrong, and the drinks were slightly overpriced for what you get. Great food, service was fantastic. Would be great for big groups. Awesome outdoor area although it was a little cold when we were there and indoors was just as good. Great staff, truely authentic, delicious, smoky and pickled food, really good beer/cider/wine selection. We will be back! Exceptional. Great selection of beers, friendly service, delicious food. we had a nice quick family dinner here. Need to go back without the kids and try more of the cocktails. Great food, great atmosphere the brisket was to die for. The wings with the Effen hot sauce was my favourite. The burgers were also a hit at our table. Very disappointed with the lack of service, food quality and definitely overpriced. Do not waste your time or money!! We booked Fathers Day for 8 ppl, were given only 7 seats. It was our first time there and no one told us how/where to order. Ordered at approximately 6:30pm to have food come out cold at almost 8pm! Serving portions were small and overpriced ($55.00 for one sausage, 3 slices of brisket, a handful of pulled pork, two small buns and pickled veg) No wonder they make you pay before you get your food. Unfortunately, no amount of free food offered will ever make us go back. We booked 10 pax for a birthday. Service was good, however food was a little less average. Bbq meats came out dry and tasteless, definitely not worth the price you pay. No kids menu, so don't bring the little ones. Better to go Ribs 'n Burgers! The food was great! The serving sizes were just right, there were 7 of us and we have a couple of the meat trays, sides and ribs, and everyone was full. Food was nice but a bit over priced for what you get. Good ambience and good setup. Web page needs updating as menu has changed and beer list was not up to date. Food was borderline ok. The mac and cheese was more cheese than anything else, the kids couldn't even eat it. The shared platter was dry, and really fatty. Staff were lovely. Great outdoor space. Very unhappy mentioned it was my sons birthday - was meant to get a free drink - strike 1, then wanted to charge $6 extra for small shop bought cake that we had just blown the candles out - we already had cut it. Left in distaste - poor form. I had high expectations for Up in Smoke. Sadly the brisket was practically flavorless, the pulled pork only a little better, the jerked chicken was totally flavorless. All in all it was a little less than average I thought. We have high standards for food and I can honestly say my versions of the same dishes are much more flavorful and I am not a professional cook. It's a hipster joint and still pretty relaxed. Good crowd for a weekend. Excellent range of beers so you can still have a good night out. Give it a go, maybe we went on an off night, being a weekend they were very busy and that may have been the problem with the lack of flavour. Price point is a bit high for what we got on the plate. Get the mac and cheese and lots of it. 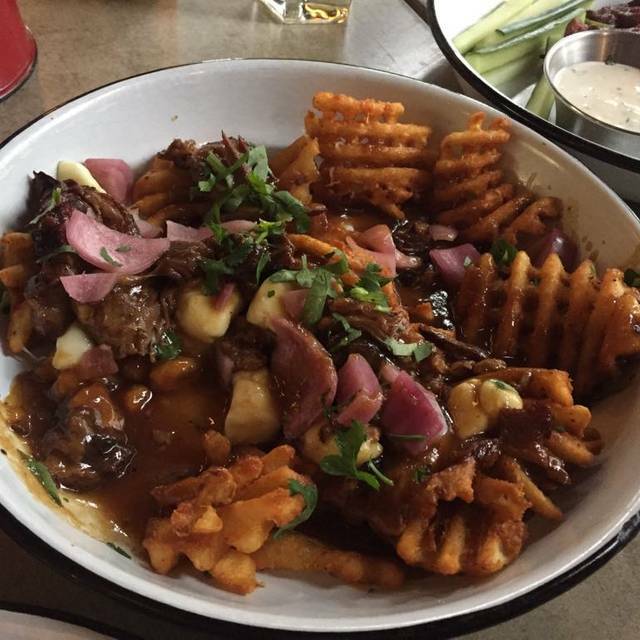 The poutine was also amazing, and the jugs of beer are a great option. Great food, atmosphere and wheelchair friendly entrance! Menu is authentically BBQ with the classic sides, nothing is overdone or outrageous but just good a wholesome. The food was nice, but I think the table service was severely lacking. We had to ask for plates when the sharing food arrived. Not one food or drinks order was taken by the service staff, and no one asked if everything was ok. It was not a busy day, so that was little dissapointing. It was quicker and easier to order at the bar. However I have to say the bar staff were extremely friendly and accommodating, which made up for the lack of personalised table service. Excellent food but service was very slow and all staff members seemed confused by the basics of serving customers. Had to ask for drinks after sitting with empty glasses for half an hour. Staff were lovely but didn’t seem to know what they were doing. Food and cocktails were great. We visited Up In Smoke on Valentine's day. We loved the authentic look and feel of the venue and our check-in and seating experience was fast and efficient. Unfortunately, our experience went downhill from there. We ordered the mozzarella sticks (delicious) and spicy buffalo wings as a starter, followed by pulled pork, brisket and a full rack of ribs as a main. With the exception of the mozzarella sticks, all of our items arrived lukewarm /cold. The ribs appeared well cooked, with a good smoke ring, however, the sauce tasted liked Ketchup and they were cold upon arrival. The pulled pork was a good texture, but again overly sauced and cold upon arrival. The brisket was by far the worst - not only was it cold, it was covered with a large jelly-like layer of fat and had zero flavour - I would liken it to a flavourless roast beef. It's worth mentioning that our reservation was at 5:15 PM - the venue was only at 10% capacity, so there really was no excuse for cold food. As BBQ enthusiasts who have eaten BBQ in 25+ states across the USA, we were so excited to try out Up In Smoke. We had lots of questions about the type of smoker used, how long the meat is cooked for, where the chefs trained etc and our waiter couldn't answer a single one of our questions. Sadly, we will not be returning. American food is always something I search for. I have been to up in smoke about 4 times and the quality of food hasn't let me down at all. When they have adjusted the menu it has been slightly. One thing they need to work on is ordering from the bar with the line that works its way between tables and also the service from their staff. Waitress asked me if I was ok, said I booked a table for 12:30, response was "huh", I then said I have booked a table, she says "what". Hmmmm. In summary I come for the food not the service. Went to Up in smoke in the Xmas break with family. Everyone enjoyed and the food very tasty and good beer selection. A great place for a group of people and, if like me, you like some alternative music. Will definitely go back. Always delicious, great beer, great food. Looking forward to going back. The tacos, beef brisket tray and beef brisket sandwich all tasted really great. However, for the price you pay, serving sizes aren't particularly generous. They charge you $3 for a side of chips with the sandwich and you only get a few. You only get two slices of brisket with limited sides, and the tacos are tiny. The loaded potato skins were tasteless, and quite small - a shame considering you only get two of them. One of our party is a coeliac, and we learned that Up In Smoke chips are battered - and they also don't offer a gluten free bread option! That locked out most of the menu for my friend, which was disappointing. It's not hard to offer gluten free bread options for the sandwiches. The venue was also quite cold. I'd likely order again because the quality of the meat is nice, but i'd probably just order takeaway next time. Not really a place to linger. Staff were super nice though! Will definitely be going back. The pork ribs were to die for! I've always been a 'take it or leave it' kinda gal when it comes to pork (mostly leave if lol).... Tried Up In Smoke for the first time over the weekend and HOLY MEAT HEAVEN!!!!... I have now reached a point where I think people should be voting 'yes' to wholesome adult relations with pulled pork. GET IT IN YA!!!! I've been here several times and the food is always good. It was busy so it took some time to order, but once we did the food was out quickly. A few menu changes since the last visit, so a couple of favourites, were no longer available. Regardless a lovely time was had and I look forward to going again. If you like meat and pickles then you'll love the food here. And the staff were all happy, helpful and fun. Highly recommended for a quality casual meal. Yum. Impromptu dining, at the last minute! Loved the ability to book at the last minute at one of my favourite restaurants. We were undecided on what to have for dinner, but as soon as we saw Up in Smoke on our app, we knew we had to book. 15 mins later, and we were sat down with our selection of the "Up in Smoke" sandwich, and the beef brisket - both servings are now much bigger than the last time we visited. Oh - and don't forget the fries! The service slightly let down the whole experience, but overall, will still keep coming back for more! Definitely one of the Wests hidden gems. Great food, beer and service. Perfect Sunday lunch/afternoon catch up place. Nothing to do with the venue because its great, but when surrounding apartments are finally finished up parking may get a little interesting. Very different and nice restaurant. Different menu, way of cooking and food. Highly recommend. Our group of 4 were aware of the time limit, 90 minutes, (I think this could be reviewed) we had not been here before and it took a little time to decide what to order and drink, very disappointing when we still had food on our plate and the waiter advised that our table had another booking in 20 minutes.